This is the mix of a classic block-breaking game and air hockey. Slide your finger on the screen to control a paddle. 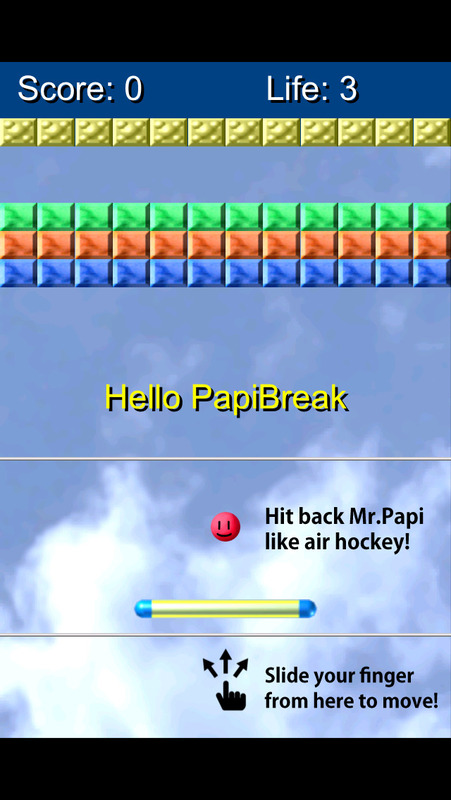 Hit back a red ball (Mr.Papi) with the paddle, and break all the blocks. The ball bounces to the direction the paddle is moving. If you hit the ball faster with the paddle, the ball moves faster. Balls fall by gravity. If all the balls fall to the bottom, the lives decrease, and the game ends if there are no lives. - The scores and lives are reset for each level. - This app has 8 embedded levels and you can get more levels by pressing "More Levels" button.